Is confidence a skill you can develop? Have you ever bounced back from a blow to your confidence? What did it take? Most of us pick ourselves up, dust off, try again, and stay motivated by imagining ourselves stepping up to the plate next time and succeeding. But when a child or an adult repeatedly falls short, the toll inside can be devastating. Multiple blows to confidence erode the image of the self as successful. And this ability to visualize success is key. 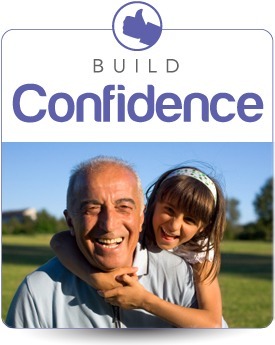 Do you need help building confidence and self esteem in your child, your team, or yourself? Dr. Hellerstein’s SEE IT. SAY IT. DO IT!® process gives you a visualization process to engage the senses, movement, and visual brain. The results? The skills to overcome obstacles and become effective in any area of life. As success snowballs, confidence increases. Build confidence, and you’ve got a way to bounce back — and bounce higher. Who can apply these solutions? The companion workbook, a collaborative effort, See It. Say It. Do It! Organize It! Can You See … Yet Be Blind to Your Possibilities?